Foss.in 2009: The best foss.in. Ever. There are technology conferences, and then there are gatherings of passionate technology enthusiasts. You will most likely not know what I am talking about, unless you saw that someone wrote a software for controlling a toy-car, using it’s blue tooth module, from an Nokia phone, at the event. You will most likely not know what I am talking about, unless you were at Nimhans Convention center at Bangalore between 1st to 5th December 2009. Foss.in had its beginnings 10 years ago, as linux bangalore, whose objective was the popularize free and open source software to local Indians. From there, from being an end user Linux evangelizing conference to being a developer focused event, where the developers are the super stars, where even the main talks, which are very good themselves, are not the main part of the event, it has come a long way. Workouts were the main focus of the event. Unlike main talks where a speaker addresses a large audience, at workouts, group of interested people hack on something of interest. Workouts were introduced in foss.in last year and workouts were foss.in this year. New curious developers attend workouts, ask questions, go home, poke into the code and start submitting patches. And then they become new contributors to the project. No kidding. Here is an account of one such case by Praddepto, an active KDE developer, who himself got into KDE at an earlier foss.in, similarly. There were workouts focussed on fedora, kde, debian, maemo, mozilla-weave, wikipedia and even the kernel. The main talks ranged from Python Metaclasses and their use in Django, that I presented, to hardware breakpoints usage in Linux and development of mobile applications using Maemo. Several speakers had developed or mentored Google Summer of Code projects in their area. I was interested obviously, in the web development part of the conference. 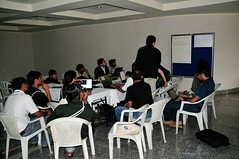 There was a workshop on web development using Pylons and a widget library. The speaker Krishnakant has been using Pylons to develop GNUKhata a web based FOSS accounting software. SahanaPy is a disaster management system developed for help during Tsunami, using php. It is now being re-written using Web2Py. Automating python build process using buildout was also there. I am happy with Django, pip, fabric, git, vim, wing IDE and our tool chain in general; but it is good to know what other options are out there. I now, only appreciate our tool set more. ;) On a more serious note, it is a challenging task ahead to try and fit in some of the takeaways from other tools and patterns of development into our existing ones. There were talks on Cloud computing. Open source and clouds by Archana Kumar and a talk by Janakiramm on, its advantages, how infrastructure as a service (Ec2, Rackspace, Mozy) and platform as a service (GAE, Azure) compare. WikiAnalysis by Kiran J, shows in what sense a wikipedia page has evolved over the period, that aims to help admins to check Vandalism by gaming the system. A group of people with a common bias, can gradually lead the page to a different (biased) tone. Such cases may go unnoticed because it is not Sock Puppetry, merely because many people are involved. Using the revision analysis, this tool, helps identify such cases. Among the non-web talks and sessions, there was a detailed analysis into the Linux file system by Lennart Poettering. Ramkumar from IIT Kharagpur(ranked as the top Indian Engineering institute) explained compiler optimization techniques employed by Unladen Swallow. Gopal, a lead developer for php opcode cache APC, spoke about Libjit, and explained what it takes to build a fully functional jit, that is today in the heart of all interpreters. There were of course so many more sessions, that being held in parallel, I had to choose. The sessions on iphone bluetooth module, palm pre and scientific computing in python, I’d have loved to attend. As for the Kernel, Balbir Singh spoke on incremental development and Suparna Bhattacharya was present to assist for the workouts. 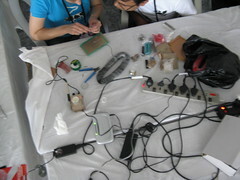 The keynotes were delivered on all the days by experts and were very good. The keynote by Philip Tellis called “Shut up and Hack” started by saying “Have an itch, will scratch” and demonstrated a lot of quick hacks. It reminded me of the key note by Chris Wanstrath on the need to have a side project. He spoke about the hacker mind set, how somebody is a hacker, that reminded me of Paul Buchchiet’s the Hack definition. Mrinal KalaKrishnan, flew in for the last key note, from Los Angeles, where he is pursuing PHD in robotics. He, after working for 2 years on enterprise software, found his calling in robotics and is a lead developer of ROS (Robot Operating System, a BSD licensed “meta operating system”). 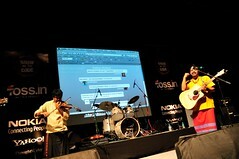 There was music party organised on last 2 days, post the keynote. There was an indigenous rock band on friday by Blues Before Sunrise and Raghu Dixit performance on Saturday. Raghu Dixit sang the poems of a 9th century Kannada poet but to the hip-hop and rock music. It was brilliant. 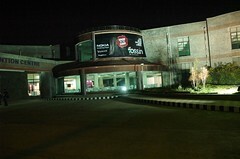 The event was organised by the team foss.in lead by Atul Chitnis. Atul mentioned this was the last event he will be driving; however he will be advising the future ones. He also mentioned that, as free and open source software have become dominant anyway, from next year, the event can be about technology itself, and not restrict about free and open source alone. All in all, speakers, delegates, organizers everyone agreed that this was the best foss.in ever. The images used in the post above are licensed as CCA by kishorebhargava, Sujith Haridasan, swati_sani, x_jamesmorris, swati_sani, swati_sani respectively. Here is how I found it! Thank you for reading the Agiliq blog. This article was written by lakshman on Dec 10, 2009 in India .